Dale's clever idea got us thinking about what it would take to get people to slow down in general — not just in their cars. Can you imagine if, on a day when you were particularly busy, your spouse could clock your speed and pull you over for a little respite? What if you could give each other "speeding tickets" for being too rushed. Maybe after three tickets in an allotted time frame, your spouse would have to make you go on vacation! Nearly 20 years ago, when we were first married and living in Pasadena, Calif., we attended the same church as Dr. James Dobson. One Sunday morning, he made a guest appearance in our newlywed class. In his lesson, he said something that got the full attention of every neophyte in the room: "Overcommitment and exhaustion are the most insidious and pervasive marriage killers you will ever encounter as a couple." "Overcommitment and exhaustion are the most insidious and pervasive marriage killers you will ever encounter as a couple.". We've never forgotten that. In fact, we've been working at guarding against busyness ever since. Once you realize the harm busyness can have on your marriage, you become more conscious of how much or how little time you have together. No matter how much time stealing, time stretching and time bending we attempt, we always find ourselves up against a certain mathematical law: Thirty-two hours' worth of tasks can't be crammed into a 24-hour day. We are busy; nobody's disputing that fact. The question is "What are you busy doing?" Busy people rarely give their best to the ones they love. They serve leftovers — the emotions and energy that remain after one's primary attention has already been given to others. Too drained, too tired or too preoccupied, they fail to give their loved ones the attention they deserve. And a marriage cannot survive on leftovers forever. Here's a little trick we learned from our friend John Maxwell. He's one of the most productive men we know, but he makes an effort to give his best time to his wife, Margaret. "Years ago," he told us, "when something exciting happened during the day, I'd share it with colleagues and friends. By the time I got home, I had little enthusiasm for sharing it with Margaret. [So] I purposely began keeping things to myself until I could share them with her first. That way, she never got the leftovers." Of course, this principle applies to more than just sharing the news from the day. We give our best to our spouses when we give them attention and energy for the things -they'd like to talk about as well. One of the most difficult things some people ever have to do is say no. 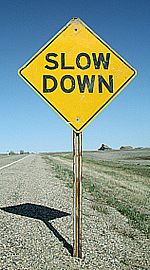 Yet this little word is one of the strongest weapons against busyness. We've seen people physically collapse from fatigue, drown in depression and develop debilitating illnesses because they never said no. If you suffer from the disease to please, treat it seriously and assert yourself. Begin by making a list of things on your plate that you'd like to say no to. Ask God for discernment about what people and activities He has called you to. Then discuss them with your spouse or a mentor. Chances are he or she can coach you on wielding the mighty power of no. Now that you've read about the impact busyness can have on your marriage, don't be tempted to think that putting these principles into practice will come easily. You've got to get about the business of eliminating busyness from your relationship. Article copyright © 2007, Les and Leslie Parrott.